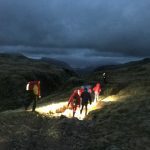 Incident Details: A group of 4 walkers became temporarily stuck at the summit of Glaramara when two of their number were unable to negotiate an icy step off the summit knoll, and then became very cold. One of the Team’s dog handlers set off to assist them from his home in Borrowdale, and a small group of Team members went down the valley to support the evacuation. Other Team members initially stood by in case there was a need for further assistance but this was not required. By the time the search dog handler arrived at their location, the group were very cold. It took some time to evacuate them down to Mountain View. They had probably underestimated the difficulty and physical demand of the route in the prevailing icy conditions. The Team ensured that they reached their transport safely, and then stood down.